In 2009-2010 Marianne Connors spent a year in Belgium as part of her choral scholarship at St Michael's Church, Mount Dinham. 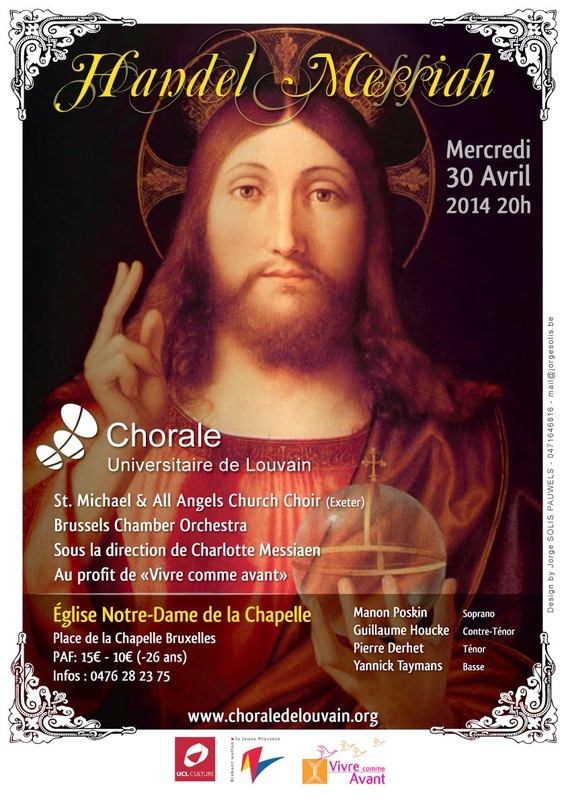 In Louvain, she was welcomed by the choir of the Université Catholique de Louvin. The choir was founded by self-confessed Anglophile, Charlotte Messiaen, in 2004.
organised a grand celebration - a concert of music from Handel's "Messiah" performed in collaboration with Marianne's choir. 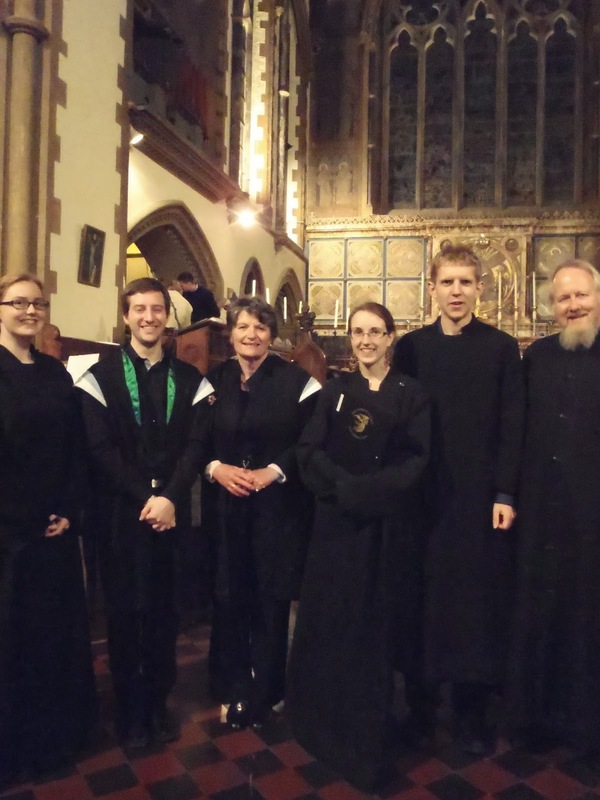 On Friday evening the Belgian choir joined their English colleagues at St Michael's. At the end of the month the English singers will travel to Belgium for two more very special performances. 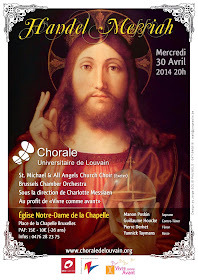 On Tuesday 29th April they will be at the Aula Magna Concert Hall in Louvain-la-Neuve, and on Wednesday 30th April at L'Église Notre-Dame de la Chapelle in Brussels. Friday's concert at St Michael's opened with a gentle procession through the nave of the church, allowing the audience to see and hear the Belgian singers at close quarters. With no accompaniment, the choir sang ten beautiful songs. Most were in Latin, but Thomas Tallis' "If ye love me" was sung in perfect English, and the final song was one of Jo Akepsimas' settings of the French poetry of Michel Scouarnec "Le vent souffle où il veut" (The wind blows where it will). For some of their songs, Marianne joined the soprano line. After "Le Vent" the members of the St Michael's Church Choir joined in as well. With Alex West playing the organ, and Charlotte Messiaen conducting, the full ensemble sang extracts from George Frederic Handel's "Messiah". After opening with the rousing words "Behold the Lamb of God", the choir gave up the floor to a very special soprano soloist. 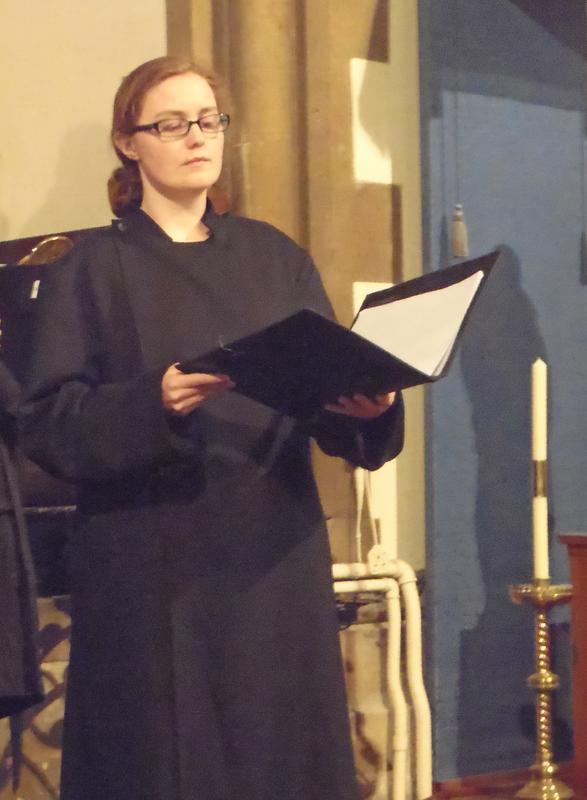 Erika Borley, with only the gentlest accompaniment from Alex (and often singing unaccompanied), gave a perfect performance of the tragic aria "He was despised, and rejected of men". This was by far the longest piece of the concert (over ten minutes) and incredibly impressive in its simplicity. Erika's confidence and stamina, and exquisitely beautiful singing were amazing to see and hear. Four more choruses from the Messiah completed the concert, with an impressive recitative from the back row of the choir. St Michael's Bass, and one of the organisers of Friday's event, Richard Barnes introduced the final extract with the Words from Psalm 22, "All they that see him, laugh him to scorn. They shoot out their lips, and shake their heads, saying . . . " leading into the full choir's rendition of "He trusted in God". The atmosphere of tragedy and passion gave way to celebration at the end of the concert, as 'cadeaux' were exchanged and several people, including Charlotte and Marianne, put into words the joy they have shared making music together. Less than a month to wait for the Belgian reprise!